As a result of my primary mirror now being 17 years old, and never having been re-coated, I decided to replace it. I could have it re-coated, but that would mean shipping it overseas plus paying for the coating and the return shipping. And then I would be without a mirror for quite a while. Instead, I applied for funding from the Kingdon-Tomlinson Fund and the Auckland Astronomical Society. And together they have generously approved to fund my purchase of a R.F.Royce 12.5" f/4 conical mirror. This is really all thanks to my Beta Pictoris image from 2011. I have been very fortunate to get to know the good people of the Auckland Astronomical Society and in particular Dr. Grant Christie. This has been very rewarding and since December 2011 I have been invited to give various talks on Beta Pictoris and image processing to both the Auckland Astronomical Society, Tauranga Astronomical Society and latest at Auckland University of Technology. I also picked up my first astrophotography awards by winning the Scientific and Deep Sky sections of the 2012 Harry Williams Astrophotography Competition. In addition I also won the Beaumont Prize that year for writing in the society journal, for an article about Beta Pictoris. So now I'm building a larger scale version of my Serrurier truss Newtonian to house the new mirror. 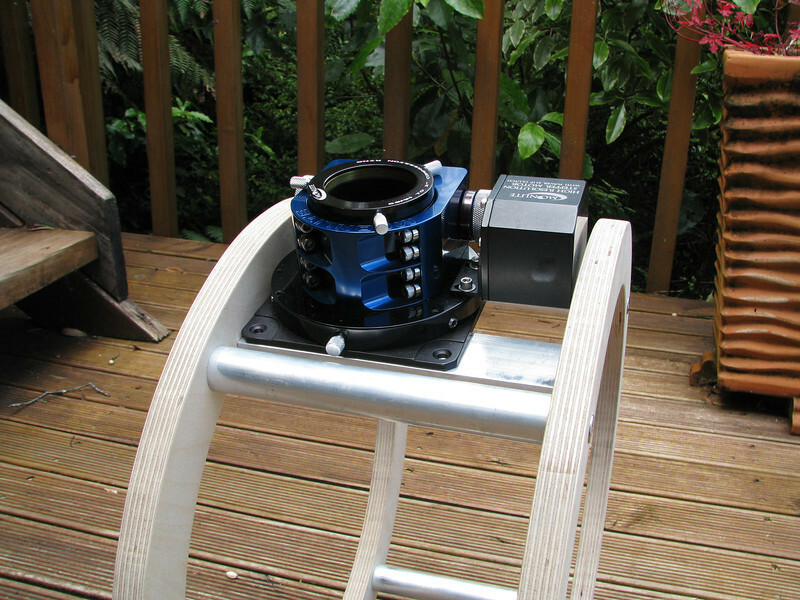 This is the same design as my 10" Serrurier truss Newtonian built in 2011. 12.5" was the largest Newtonian I could fit in the observatory since I didn't want to go too low on focal ratio. Also, I want to keep the weight at a minimum because my current setup is tracking beautifully. For this build I'm applying some weight savings here and there and I hope the 12.5" OTA with a conical mirror will weigh more or less the same as the old 10" did with a standard mirror. So far I have completed the main structural elements: Upper cage, central brace and mirror cell. I'm now working on the details around the secondary holder and wire spider. The mirror is expected to be ready in January. In the meantime I aim to finish everything else and just leave the trusses to be cut to the correct length once I have the mirror and can balance the OTA properly. Click the pages back and forward to see all the images. I will add images here as the build progresses.